Purple passion plant growing shrub‎ vine of the genus Gynura also known as Gynura aurantiaca or Purple passion, Purple passion plant perennial evergreen used as ornamental houseplant, can grow in tropic, mediterranean or subtropics climate and grow in hardiness zone of 10b+. Leaves color purple green the leaf hairy like velvet. Flower color orange-yellow with multiple needles like stamen. 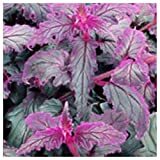 Gynura aurantiaca Purple Velvet Plant 6"